Here's yet another new feature for you guys! Things I Love Thursday! This will cover things that I am enjoying in my life right now, so it may be Music, film, TV, a certain product, or a blog! I'm just going to talk about something that is making my life more enjoyable! Today I am bringing you two things. I saw lots of people posting on Twitter that they were taking part in May Photo Challenges, and I really wanted to do one, but didn't want to jump into someone else's challenge. A while ago I started up a Facebook Group for Berkshire Bloggers with the hope that in the future we'd all do things together, like giveaways, and meetups. This seemed like the perfect opportunity for me to get the ball rolling! I had a look at a lot of previous photo challenges and came up with the one above. 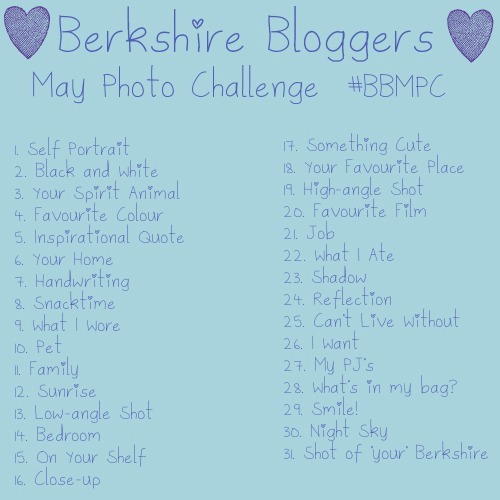 Every seemed to like the idea so from the beginning of this month on Instagram and Twitter you can follow our challenge under the hashtag '#BBMPC'. I've already done the first two days, which you can see on my Instagram! Hopefully in the future there will be a few more collaborations between us, I'm dreaming of a Berkshire Meetup! I didn't realise how much I missed these guys until they came back with this new album! It's insanely good. Don't get me wrong, it's still no where near as epic as their old stuff. However it is a MASSIVE step up from the shambles that was 'folie a deux', god I hated that album! Thankfully 'Save Rock and Roll' is brilliant, in particular I am in love with 'The Pheonix'. I think it helps that the video is awesome and Patrick Stump is SEVERELY hot. I'm not sure about the song they did with Courtney Love, she's seriously annoying and the song just feels really weird with her random dialogue over the top. I have no idea what they were thinking! They did manage to get an interesting collab in with Elton John which is nothing if not interesting! It helps that Patrick is stupidly cute in this video! JUST LOOK AT HIS FACE! I swear I am falling in love with him. I need help. So there you have it! My first Things I Love Thursday! Let me know in the comments if you like Fall Out Boy, or if you've had a cheeky watch of the video I put in this post! Love you guys!